Recycled plastic boats for Xochimilco? What will they think of next? 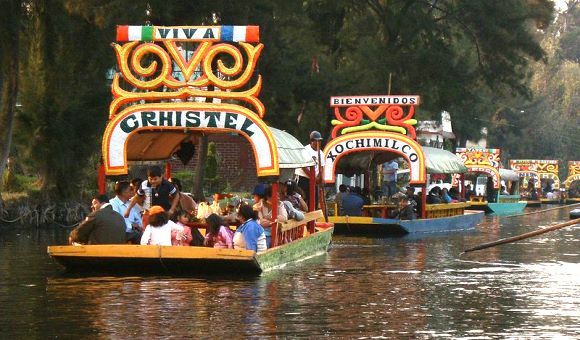 Officials in Mexico City have plans to provide the tourist zone of the Xochimilco canals with environmentally friendly boats and barges and to gradually substitute the usual wooden ones, which have very high maintenance costs. The plan was unveiled a few weeks ago by Mauricio León, director of infrastructure, modernization and innovation for the Federal District. Mexico City officials have already launched a prototype of the new, plastic, ecologically-sound craft, and hope that the owners of the traditional gondola-like non-motorized boats will form a cooperative to gradually replace them. The design of the new “technoecological” vessels was created by scientists at the National University (UNAM) and preserves the typical characteristics that have made it a widely recognized symbol of tourism in Mexico. The great advantage of the new boats, made of recycled PET plastic (some of it no doubt pulled from the canals), polyethylene and volcanic clay is their greater durability and stability. Proponents claim that since they are made of recycled material, unlike the traditional ones for which 20 trees have to be cut down to make each trajiinera, the new boats are much cheaper, require less maintenance and their durability is much greater, with the potential to last up to 120 years. There is one slight problem: the cost of the machinery required to make them. Authorities hope to persuade the boatmen to form “a cooperative able to get financing for the machines,” which will require an investment of some 5 million pesos ($380,000). This is a long-term plan, because even when the machines are installed, they can produce only about three or four boats a week, and there are an estimated 1500 trajineras currently plying the canals in Xochimilco.